Any defeat on a championship stage hurts. This one, Aaron Rodgers said, hurt the Green Bay Packers even worse. It wasn’t that they lost in the NFC championship game at Seattle on Sunday, or even the way they lost in a late-game collapse. But there were so many missed opportunities that set the stage. Rodgers said it’s a “terrorizing game,” evaluating an outcome through the scope of hindsight. Clearly, Seattle could claim no comeback was needed if not for a handful of plays that didn’t go its way, starting with quarterback Russell Wilson’s four interceptions, a fumbled kickoff and eight penalties. Still, the sheer volume of plays that could have cost the Packers points on Sunday is stunning. On Monday, left guard Josh Sitton estimated 10 missed plays had the power to put Green Bay in the Super Bowl. Watch the game again, and there were more. Situation 1: Third-and-10, GB ball on SEA 29, 11 minutes, 23 seconds left in first quarter. 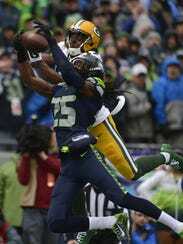 Play: Seattle’s Richard Sherman intercepts Rodgers’ pass intended for Davante Adams in the end zone. It was a curious decision from Rodgers, throwing a jump ball across the field against the NFL’s top cornerback. Rodgers later said he thought Seattle defensive end Michael Bennett was offsides, something the film confirms. Potential impact: The Packers were in field goal range, so at least three points. Situation 2: Second-and-goal, GB ball on SEA 1, 9:11 first quarter. Play: John Kuhn gets the handoff on the dive. It’s initially ruled a touchdown, but replay reverses the decision. Kuhn is down 1 foot short of the goal line. It’s also interesting to note how relatively rare it is for there to be a clear angle spotting the ball on goal line plays. On the next play, Eddie Lacy is stuffed on third-and-goal. Potential impact: Four points. Instead of a touchdown lead after the first 6 minutes, Green Bay’s lead is only 3-0. Situation 3: Second-and-goal, GB ball on SEA 6, 5:53 first quarter. Play: Jordy Nelson is open in the end zone, but Rodgers’ pass bounces off his right hand. It’s a routine play Rodgers and Nelson completed countless times over the season. Green Bay settles for another field goal after driving inside the 10-yard line. Situation 4: First-and-10, SEA ball on SEA 20, 9:37 second quarter. Play: Ha Ha Clinton-Dix intercepts his second pass of the game and returns it to the Packers’ 34-yard line, on the edge of field goal range. Clay Matthews is called for a blindside block against Wilson, bringing the ball back to the Seahawks’ 44. This sequence, along with the next play, is perhaps Sunday’s most underrated sequence. Situation 5: First-and-10, GB ball on SEA 33, 8:29 second quarter. Play: Rodgers throws his second interception of the game, this one to Byron Maxwell. The pass was intended for an open Nelson, but there was a miscommunication. Situation 6: Third-and-19, SEA ball on GB 48, 6:51 third quarter. Play: Not quite fourth-and-26, but this conversion was costly. Seattle had nothing going midway through the third quarter until a 29-yard completion from Wilson to Doug Baldwin. On the previous play, it was second-and-31, making this conversion even more improbable. Potential impact: Seven points, because of the play below. Situation 7: Fourth-and-10, SEA ball on GB 19, 4:50 third quarter. Play: Four plays after third-and-19, Seahawks holder/punter Jon Ryan throws a touchdown to Garry Gilliam, an undrafted rookie offensive lineman. It’s Seattle’s first touchdown of the game. Davon House takes a sloppy angle and loses contain, allowing Ryan to scramble outside. A.J. Hawk pursues Ryan, leaving Gilliam wide open for an easy completion. Situation 8: Second-and-14, SEA ball at midfield, 7:11 fourth quarter. Play: Clinton-Dix, already with two interceptions, jumps a route and has a third slip through his hands. With a full head of steam and open field in front of him, the he had a chance to score. Situation 9: Third-and-5, GB ball on GB 19, 5:26 fourth quarter. Play: At this point, Rodgers said, the Packers were merely “a couple first downs” from sealing a trip to the Super Bowl. One costly failed conversion came here. Rodgers’ pass to Andrew Quarless was on target, hitting him in the stomach. Quarless was past the first down marker, but the football bounced off his body. With Seattle’s K.J. Wright hitting his back, it wasn’t an easy catch. Still, it’s a play Quarless must make. Potential impact: Another set of downs. Situation 10: First-and-10, SEA ball on SEA 46, 5:13 fourth quarter. 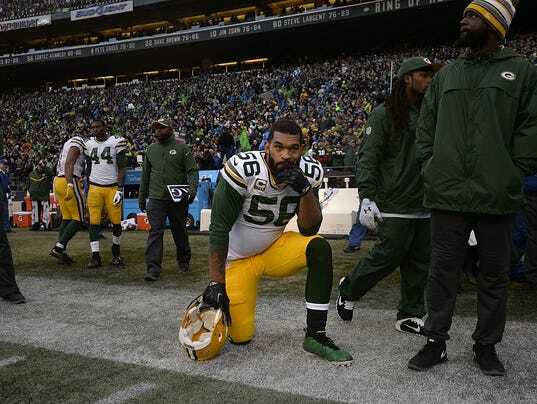 Play: Morgan Burnett heeds teammate Julius Peppers’ stop sign, sliding after catching Wilson’s fourth interception. It is the safe play, to be sure. Burnett’s slide ensured the offense would regain possession with a 12-point lead and 5:04 left. Still, there are no potential tacklers within 10 yards of Burnett when he slides, and even they appear in position to be blocked. With open field down the left sideline, it could have been a scoring play. Situation 11: Third-and-goal, SEA ball on GB 1, 2:13 fourth quarter. Play: If Seattle failed to convert this play, it would have gone for it on fourth-and-goal. Fourth down could have been more challenging than third. Clinton-Dix and Mike Neal crash hard from the right side. They are unblocked, but both go for the play fake to Marshawn Lynch. Instead, Wilson pulls the ball and keeps it, trotting into the end zone untouched. Situation 12: Onside kick, 2:09 fourth quarter. Play: Seattle’s Steven Hauschka bounces an onside attempt high off the turf. Brandon Bostick is supposed to block on the play, but he tries to catch the ball instead. Jordy Nelson is behind Bostick, in position to catch the ball. The ball slips through Bostick’s hands, off his helmet and into the hands of Seattle’s Chris Matthews. Potential impact: Possession. At this point, Green Bay is one first down from the Super Bowl. Situation 13: First-and-10, SEA ball on GB 24, 1:33 fourth quarter. Play: Lynch slips through Nick Perry’s tackle attempt at the line of scrimmage and runs 24 yards for a go-ahead touchdown. It’s Seattle’s first lead of the game, and their second touchdown within 44 seconds. Situation 14: 2-point conversion attempt, 1:25 fourth quarter. Play: Wilson has Peppers and Sam Barrington in his face as he scrambles all the way back to the 17-yard line. Barrington hits Wilson as he throws an arching, no-look pass across the field to Luke Willson, who is left open when Perry leaves him to pursue the quarterback from across the field. It looks like Clinton-Dix has an opportunity to make a play on the ball, but he doesn’t and Willson converts the two-point attempt. Potential impact: Two points. It also prevents Mason Crosby’s 48-yard field goal a minute later from being a game-winning kick. Situation 15: Third-and-6, SEA ball on SEA 30, 12:36 overtime. Play: After everything that’s happened, the Packers have a chance if they can stop the Seahawks from converting a third-and-6. Instead, Wilson completes a 35-yard pass to Baldwin. It’s a tie for the longest play of the game for either team. Tied with Seattle’s next snap. Potential impact: Seven points. Possession in overtime. Situation 16: First-and-10, SEA ball on GB 35, 11:48 overtime. Play: Wilson checks to a deep pass with both Packers safeties in the box. He completes a 35-yard touchdown to Jermaine Kearse, who is defended one-on-one by Tramon Williams. Kearse completes the process of the catch. Game over. Potential impact: At least four points, if not seven. Seattle — They don’t forget any playoff game in the National Football League’s smallest city. All 51 of them live on and on, and on. Lombardi’s bitter defeat in Philly followed a year later by the 37-0 blanking of the Giants. The late cross-field bomb to Sterling Sharpe that beat the Lions in the Silverdome, the first of Brett Favre’s 12 post-season triumphs. Of course, the Ice Bowl. When historians remember the NFC Championship Game at CenturyLink Field, what should it be called? The Big Choke would be appropriate. How else to describe a game in which the Packers, perhaps the league’s healthiest team this season, were in total control for about 57 minutes against the defending champion Seattle Seahawks before they threw it all away? Coaches, executives, players, staff, everyone in that locker room were walking around like zombies after the Packers collapsed, 28-22, in overtime. Seattle (14-4), the top-seeded team in the NFC, will meet the New England Patriots (14-4) Feb. 1 in Super Bowl XLIX. Green Bay (13-5), the second seed in the NFC, will watch from home wondering what might have been. The Packers beat the Patriots on Nov. 30. Given an additional week for Aaron Rodgers to treat his injured calf and the fact they appeared to exit yet another Sunday with no new injuries, the Packers would have been in prime position to win a second Super Bowl under Thompson, coach Mike McCarthy and Rodgers. Second Super Bowls often means Hall of Fame. As young as Rodgers is (31), there would be chances to win even more championships. Those chances remain, but that 14th title for Titletown will have to wait. It ended suddenly, as many overtimes do, on Russell Wilson’s 35-yard pass to Doug Baldwin behind Casey Hayward and, on the very next play, his 35-yard touchdown pass to Jermaine Kearse against Tramon Williams. Seattle won the overtime toss. Seattle started backed up at its 13. Seattle went 87 yards in six plays. The Seahawks turned the ball over five times, were penalized constantly and played neither with strength nor poise for almost the entire game. A powerful team with designs on becoming the first Super Bowl repeat champion since New England in 2003-’04, the Seahawks were flat, loosely prepared and obviously missing several key performers lost to injury. Alvin Bailey, forced to start at right tackle when Justin Britt was a surprise scratch (knee), was taken to school early and often by Julius Peppers. Wilson’s passer rating at the half was 0.0. The passing game was null and void. 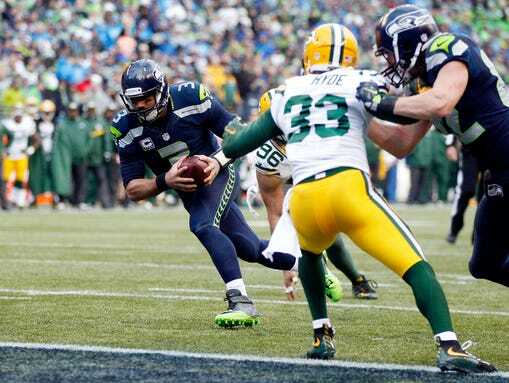 The Seahawks, even with their leather-lunged fans screaming throughout, looked inept. “Well, for the fans in the northwest, this has got to be one for the ages,” said coach Pete Carroll. “This is an extraordinary win because of who the Packers are. The Packers led, 16-0, at halftime and 19-7 with just under 4 minutes remaining. Those in the record crowd of 68,538 hadn’t left, but the handwriting certainly was on the wall. Vulnerability was evident a few minutes before that. Backed up, McCarthy ran James Starks twice and saw Rodgers’ sideline-stop pass for Andrew Quarless broken up by linebacker K.J. Wright. After Tim Masthay’s punt, Kearse dropped Wilson’s perfect pass at the Green Bay 40 and the ball bounced straight to Morgan Burnett for an interception. Rather than avail himself of an open sideline on the return, Burnett saw Peppers’ stop sign and promptly fell down at the Green Bay 43. No worries, right? Just 5 minutes were left, and the Packers had aced their four-minute offense all season closing out the Jets, Vikings, Patriots, Falcons and Cowboys. By this point, the Seahawks were selling out at the line. 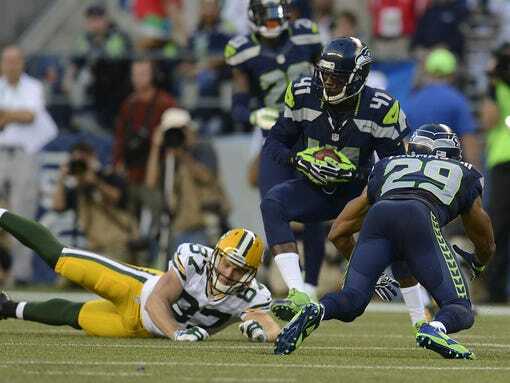 Eddie Lacy lost 4 yards in three carries and Masthay successfully punted out of bounds at the Seattle 31. Then the defense caved. Four plays gained 60 yards. Wilson’s 1-yard TD made it 19-14. Just 2:09 remained. Brandon Bostick butchered his assignment to block and whiffed on the ball. The Seahawks were in the end zone four plays later, and when Wilson rainbowed a crazy-quilt conversion pass to Luke Willson Seattle was ahead, 22-19. Rodgers, in the midst of another one of his ordinary playoff performances, moved the team 42 yards. He had three plays to win the game from the 35 at the same location and end of the field that Wilson would win it from a few minutes later. A back-handed incompletion. A botched back-shoulder fade to Richard Rodgers. A scramble and 6-yard pass to Jordy Nelson left it up to Mason Crosby. What a field goal it was, 48 yards dead-center perfect. There was life in the Packers. Then came the extra session. After the bomb to Baldwin, Seattle deployed two running backs, two tight ends and Kearse wide right. On cue, safety Sean Richardson replaced Sam Shields. The Packers got away playing Cover 0 several times late in games. The stress point is on Williams, who was in press coverage against Kearse. Wilson saw the matchup, the fact there would be no safety help and checked to a deep post. “(Kearse) has really got a two-way go at that point with me and him,” said Williams. “I was in bump and he was slightly outside (the numbers). He took an inside release and I was running with him. Williams reached across Kearse in textbook fashion by using his left hand to avoid pass interference. But the throw was perfect and Kearse hauled the ball in at the 1 with Williams clawing away alongside. Rodgers had all day to throw countless times against the NFL’s finest secondary but his passer rating was 55.8 and longest completion was merely 23 yards. The inability to strike downfield was critical to why the Packers had to settle for field goals three times in the first half. How does one sum up a defeat of such catastrophic, appalling dimensions? “I don’t regret anything,” the ninth-year coach said. “Hell, I expected to win the game. We were positioned to win the game. It’s also one that will never, ever be forgotten in Packerland and points beyond. ~The Packers and the Patriots are the only two teams to make the playoffs each of the past six seasons. The Seahawks are the reigning Champions and are steamrolling to being the first team to repeat in over a decade. Both teams have obviously been built well to get to this point. How they have it, and by whom, is fascinating. As many know, GM Ted Thompson is the Packers architect. He’s been the Packers GM since 2005. John Schneider started his career with the Packers, bounced around to Seattle (under Thompson for one year there), to Kansas City, Washington, and then back to Green Bay for a few more years under Thompson. He landed the Seattle GM job in January of 2010. In the now-almost five years since, he has quickly built a possible dynasty in the making in Seattle. Looking at their great defense, from the Legion of Boom to the linebackers and to the trenches, they are a very young team. On offense, their QB is just finishing his third season. Remember, Aaron Rodgers had yet to start a game until his fourth season. The Packers are also in great shape, although their overall talent level looked terrible last year when Rodgers was out. They couldn’t rely on their defense to win games as Seattle’s defense is capable of. Seattle, I must admit, has been very fortunate regarding injuries, however. This year, they were 6-4, tied with San Francisco, and trailing first place Arizona by three games. At that point in time, with a game at San Francisco on the slate in primetime, the playoffs were a 50-50 proposition, and it appeared the Wildcard route would be their only path. Well, one team lost it’s starting QB and that was Arizona. They fell apart. Seattle didn’t lose their QB, not even for one game. Their star RB Marshawn Lynch never missed a game, neither did their stars Richard Sherman or Earl Thomas. And star LB Bobby Wagner recovered from a nagging toe injury and Kam Chancellor got healthy too. Seattle didn’t lose a game since then, while Arizona only won two more games after that point they had a three-game lead on both the 49ers and Seahawks. Seattle also didn’t lose their star safety Earl Thomas to a career-ending neck injury like the Packers did theirs, Nick Collins. Seattle didn’t lose OT Russell Okung as a rookie (Schneider’s first ever draft pick), like the Packers did with Derek Sherrod. Sherrod may have been a Pro-Bowl quality bookend tackle for years to come, we will never know due to the devastating double-break of his leg in Kansas City. Seattle didn’t lose their best ILB, Bobby Wagner, like the Packers did in 2011, Desmond Bishop. And Seattle didn’t lose their best TE to a career-ending neck injury like the Packers did in 2013 with Jermichael Finley. So there’s no doubt that luck, good or bad fortune regarding injuries, has been a significant factor in each team’s results and prospective outlooks going forward into this NFC Title game and beyond. But there are a few key moves, made by Schneider, that have made Seattle the better team right now and the favorite going forward into the next few years. Let’s take a look at how John and Ted have built these two franchises. Here are some highlights and lowlights. Each, of course, has many more highs than lows. 2012 Draft Pick Russell Wilson, Round 3 pick #75 overall. 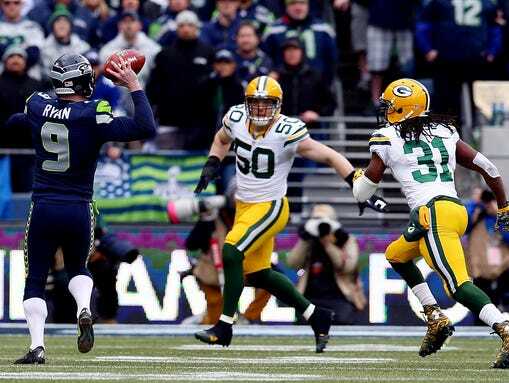 Schneider had already signed free agent QB Matt Flynn from the Packers, and he was expected to take over from the old Matt Hasselbeck as the Seahawks new QB. Wilson was “too short” at just 5-10. But Schneider loved him, and convinced Pete Carroll that he would too. Pete did. John felt that Wilson was too good to not grab in the third round. The 2012 Draft was supposed to be all about Luck & RG3. And Ryan Tannehill went high in the first round also. Unbelievably, Jacksonville selected a punter five picks before Seattle grabbed Wilson. Of course, that’s because one draft earlier, the Jags had selected QB Blaine Gabbert one pick before JJ Watt was taken by Houston. Ouch. No wonder why Jacksonville continues to lose and lose and draft in the top part of round one every year. Flynn was sent to Oakland before that season started as Seattle knew early in camp that Wilson was all that they had hoped for, and then some. Trading a 4th & 5th round draft pick to Buffalo for 24-year old Marshawn Lynch. This is the move, directly, that has made the difference. Eddie Lacy has been great, was the NFL Offensive Rookie of the Year last year, was and is still great, and he has a longer future ahead of him (barring more of those bad luck injuries the Packers seem to get hit with more than anyone else). But without Lynch, there’s no Super Bowl last year for Seattle. And there would not have been a Beast Mode Earthquake run in the 2010 playoff win over the then-defending champion Saints. He’s the Beast Mode they thrive on. In his past 4 seasons with Seattle, he’s missed just one game. That’s lucky. He had missed plenty of games in Buffalo when he was younger. He’s rushed for 1204, 1590, 1257, and 1306 yards, and scored 13, 12, 14, and 17 touchdowns these past four regular seasons. He also has 73 receptions total the past two seasons. The Packers had been talking to Buffalo to obtain Lynch. So had Seattle. When Lynch was drafted in 2007, Schneider (then with the Packers with Thompson) really wanted Lynch, but Buffalo grabbed him at pick #12, four spots ahead of the Packers sitting at #16. The Packers settled for DL Justin Harrell. Had The Packers upped the offer to Buffalo to a 3rd round pick instead of 4th (the 5th rounder was conditional and for the following year), the Packers would have had their own Beast Mode. Who knows how that would have helped Green Bay, or if he’d have been able to play every game since then except one, as he has in Seattle. Knowing the Packers bad luck, he could have torn an ACL or broken his leg, neck, etc. But for certain, Seattle would not have been the same. Yes, that basically is the Legion of Boom, plus their two great linebackers. Earl Thomas, #12 overall, was their second first-round pick in 2010, Scheiders’ first with the team. LT Russell Okung was their first in that round. All the others were taken much later in drafts, including Sherman who went in the fifth round and went after the Packers selected a TE who bombed out, and another cornerback (House) who has proven to be a fraction of the player that Sherman has been right out the gate as a rookie until now, where he is considered to be the best CB in the NFL. Now in all honestly, House has been okay for a fourth round pick. You’ll take a result like him with your fourth or fifth round picks. But late round four or round five, the difference between Sherman and House is so significant, that Schneider wins a big one here over Thompson. I consider this the reverse of fortunes that Thompson pulled on Belichick in the 2006 Draft when he traded down with him, as Belichick wanted WR Chad Jackson from Florida. Later in the second round, Thompson grabbed a WR of his own, Greg Jennings. Jennings was great and instrumental in the Packers being great and winning the Super Bowl. Jackson busted. House has been better than Jackson ever was, but Sherman has been sensational, obviously, because he’s made sure we all know. I’ll always wonder if Ted interviewed Sherman in that draft process, and was turned off by his outspoken, loud persona. House is much quieter, like Ted is. Signing DE Michael Bennett, Cliff Avril, and O’Brien Schofield to as free agents before 2013 season. They all are still key players right now and all have gotten to Aaron Rodgers in the past. They were proven, but still young, hungry pass rushers. Those guys are the equivalent of the Packers additions of Julius Peppers and Letroy Guion, only younger and less expensive, at least initially. Bennett and Avril earned themselves lucrative extensions. Trading so much for Percy Harvin. Now here’s the thing about both of those: Neither move hurt them, and Harvin paid some big dividends in his limited time in a Seahawks uniform. He was phenomenal in the Super Bowl. And he was great in week one this year against the Packers. The guy’s attitude was a problem, and they shipped him out for less than they paid, but they won the Super Bowl with him, and this year, they still are the #1 seed and the Super Bowl favorite, despite having him for the first third of the season. He helped them more than he hurt them, so that’s not even a mistake that was costly. Same thing with Matt Flynn. While they overpaid for him, and overrated him as a starter, they cut their losses right away, and moved to the rookie Russell Wilson. Of course, it’s helped that Wilson has never missed a single game now through three full seasons and post-season. They never have to play Tarvarris Jackson. Some teams, like Arizona, St. Louis, Green Bay last year (Wallace, Tolzein, Flynn) have to try and survive with #2, #3 QB’s. Not Seattle. 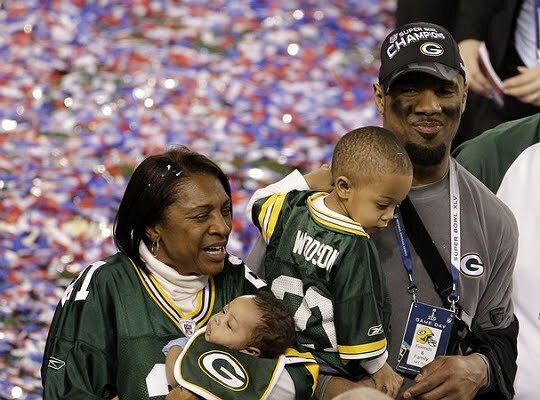 Woodson is now a first-ballot Hall of Famer, and the Packers got most of his good stuff and all of his great stuff. He was the 2009 NFL Defensive Player of the Year, and his attitude and leadership was paramount to the Packers miracle run to the Super Bowl the following season. The importance of Charles Woodson cannot be forgotten. One needs to simply watch the Super Bowl against Pittsburgh and compare the first half to the second half to see how different the Steelers passing game was when Woodson was in and out. Big Ben knows. 2008 second round: Brian Brohm and Pat Lee. Two total whiffs. Jamaal Charles would go a few picks after Thompson took Brohm and Lee. Where would the Packers be had they Charles and that game-breaking speed? 2012: Had Ted Thompson selected ILB BOBBY WAGNER instead of DE>OLB NICK PERRY, who went a dozen or so picks later? 2011: Had Ted Thompson swung for CB RICHARD SHERMAN instead of CB DAVON HOUSE with his 131 pick. Or with his #141 pick instead of TE D.J WILLIAMS. Schneider took Sherman at #154. Again, House at that point in a draft was a nice pick. But look how Sherman has helped make Seattle great, whereas House is still a third or fourth CB on the Packers behind Shields, Williams, and Hayward. ~The Packers opened the 2012 season at home against the San Francisco 49ers, and lost. That was against Alex Smith. 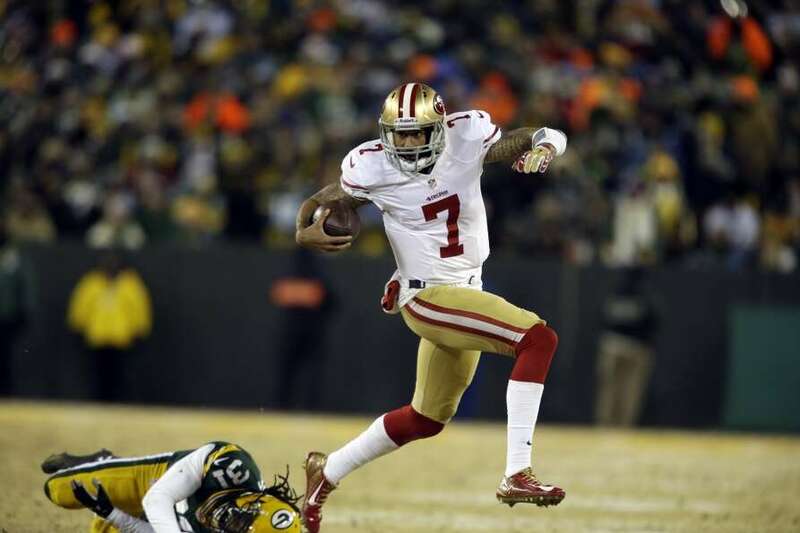 The Packers ended the season in San Francisco in the playoffs, getting embarrassed by the 49ers Colin Kaepernick’s record-setting legs. The Packers opened the 2013 season losing at the 49ers. And then the Packers ended the 2013 season losing, again, to the 49ers, this time back at Lambeau Field. 2013: Packers opened the season losing in San Francisco, and ended the season losing to San Francisco, on the hallowed grounds of the Frozen Tundra. 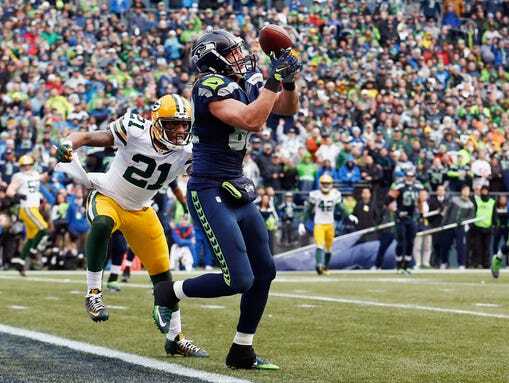 This year, the Packers opened the season getting whipped by the Seahawks, in Seattle, 36-16. They hope to break that pattern this Sunday, in Seattle again. However, there have been six instances of the same teams meeting in Week 1 and then again in the conference championship. All six times, the team that won in Week 1 also won the conference title game. The Packers are facing long odds and hoping to buck historical trends. Even on good legs, Rodgers has been battered in Seattle, and the offense has scored a total of 28 points in 2 games there over the past 3 seasons. One of those games was with Greg Jennings, James Jones, and Jermichael Finley. The other was week one this year, where the Packers managed just one touchdown, which was set up when the Seahawks fumbled a punt at their own 30-yard line, giving the Packers a short field. #1- the refs to call the “points of emphasis” from the off-season, which means throwing flags at the Seahawk DB’s on every play as they re-direct WRs & TEs beyond five yards, and they grab and tug jerseys when the receivers run in front of them across the field, or run past them. Seattle was the reason there was a “point of emphasis” in the off-season in the first place. #2- They are going to need to have a great gameplan to contain Russell Wilson and keep him from scrambling for huge first down runs.He’s a good passer. He’s smart. But what’s special about him is his ability to escape the pass rush and run for crucial yardage. Dom Capers cannot send big blitzes against him because Wilson will find the gaps, either through the line or around the edge when one guy loses the edge. We’ve seen that countless times. We saw Jarrett Bush and Mike Daniels lose the edge last year on a critical thrid down failure to the Niners as Kaepernick ran around the left edge on a 3rd and long on the Niners game-winning drive. We have seen Mike Neal and Nick Perry give up the edge more times than we can count. We also have seen Ha Ha Clinton-Dix lose containment on the edges. And last week we saw Sean Richardson collapse to the inside and allow DeMarco Murray the right side for a big gain around the edge down the sideline. I don’t see the zebras doing their job properly (they rarely do), and I don’t see all the Packers defenders doing their job all the time. All it takes is one guy, one time, to lose his gap. The brilliant, and athletic, Wilson will make them pay. In addition to those two focus points, the Packers are going to have to tackle better. They missed 16 tackles the first game in Seattle. They also are going to have to block for Eddie Lacy and James Starks. Besides the Seattle DL, they have to try and keep Bobby Wagner and KJ Wright from blasting in for losses. They also have two great safeties, Kam Chancellor and Earl Thomas, who love to fly up and deliver huge hits. At least Chancellor hits up high, whereas little Earl Thomas doesn’t mind taking aim at the knees of the runners. Giants offensive coordinator Kevin Gilbride retired earlier this month but he’s still perfectly qualified to speak on the Seahawks’ defense, which gave New York fits back in Week 15. When it was over, Seattle cruised to a 23-0 win, holding Eli Manning to 156 passing yards (to his own teammates, anyway) and a mind-boggling five interceptions. That aggressiveness has been a hallmark of the Seahawks’ ball-hawking defense, one that critics and admirers alike — including Gilbride — say often skirts the rules with little consequence from officials. Giants wide receiver Louis Murphy said Seattle’s secondary “just don’t seem to care about the rules,” and former NFL VP of Officiating Mike Pereira thinks the Seahawks are taking advantage of the officials’ inconsistently when it comes to throwing flags. “They look at it and say, ‘We may get called for one but not 10,'” Pereria noted. I believe the Packers are definitely capable of winning this game, but they need Rodgers to be able to move better than he did last week. They also need to block well and get Lacy + Starks 30 carries combined. It’s very important to get the quick Randall Cobb isolated on Richard Sherman, in my opinion. Sherman is great, and especially great competing up high for high balls, deep balls. If he has a weakness, and he does, it’s his quickness. He’s 6-3, tall and lean. A long strider, fast. He’s not a little 5-8 quick, low to the ground guy. That’s where Cobb has an advantage. Sherman is also very intelligent. He will grab if beaten. Coach McCarthy and the whole team need to pressure the officials to CALL IT PER THE RULES. That means NO HOLDING of receivers. It also means no route-redirecting, bumping, beyond five yards from the line of scrimmage. If they can get the zebra’s to call the penalties early, as they did against New England on Brandon Browner, then it will give Cobb the space he needs to eat up the Seahawks. I can see him having a huge game, something like 10-12 catches. Seattle doesn’t miss many tackles, so I don’t see a ton of yards. But if he’s feasting on the defense for 8-15 yard games, it will move the safety his way, and allow a chance for Jordy Nelson to hit them deep on the other side against Byron Maxwell. The Packers defense has to tackle Marshawn Lynch in his ACL area, his knees, as the Redskins did to Adrian Peterson in 2011. Lynch doesn’t want to go down being hit high, he bounces off and breaks more tackles than anyone. I cannot confirm that he applies silicone to his jersey and pants, but it wouldn’t surprise me. Regardless, DB’s must tackle him, hard, in his thighs and knees. I just don’t see everything going right as planned. I see the same lazy/incompetent officiating from the refs, allowing Seattle to get away with their molesting Packer receivers. And I see Seattle’s pass rush getting to Rodgers too often, making him look bad as he did at Seattle in week one, as he did at Detroit in week three, as he did at Buffalo in week 15, the loss that cost the Packers the #1 seed and making this game be in Seattle, not at Lambeau Field. I also see the Packers running on first down too often, predictably, and Lacy getting battered down for a lot of no-gains. The Packers should do everything they can to be unpredictable, go play-action on first down. Run on 2nd & longs, etc. Keep that aggressive defense guessing, and wrong. 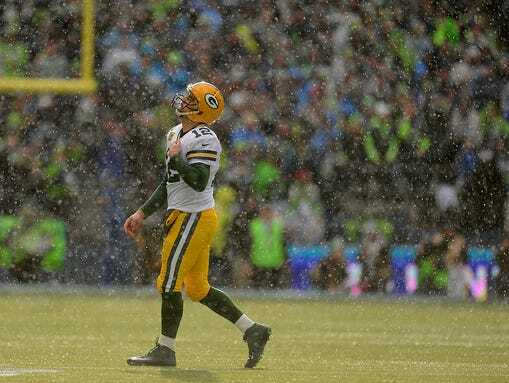 We labeled the Packers a “pretender masquerading as a contender to the NFL throne” after Green Bay’s ugly 36-16 loss to the Seattle Seahawks in the 2014 NFL Kickoff. It was sound advice for a Packers squad that went 11-2 down the stretch behind the power of the NFL’s No. 1 scoring offense, an attack that rained down points on a league-best 46.7 percent of their drives this season. That said, all is not well. Rodgers is still fighting a painful calf strain that made him look human for three-plus quarters against the Cowboys. His Packers, meanwhile, haven’t been the same team on the road, putting up 17.2 fewer points per tilt in enemy territory — the largest differential between home and away points per game totals of any team in 2014. The Packers aren’t the same squad we saw at CenturyLink Field in September, but the Seahawks have undergone a metamorphosis of their own. 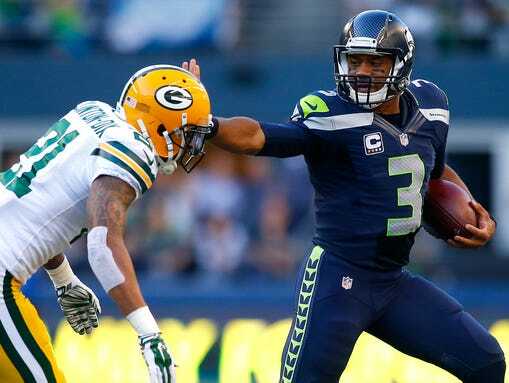 Playing their best football of the year, Seattle’s smothering defense against Green Bay’s high-octane air attack has the makings of a January classic. How is the greatest signal-caller of our day under the gun? Simple. If that calf acts up, we’re in for another dose of Rodgers looking like a shell of himself against the NFL’s most powerful secondary. The Packers game-planned around his limited mobility against Dallas, lining up Rodgers in the pistol or shotgun for every snap outside of Green Bay’s three victory formation kneel-downs to seal the win. For much of the game, we saw a passer who couldn’t plant his feet, leading to Rodgers sailing throws high for three-plus quarters. If Rodgers can operate the way he did over the final quarter against Dallas, hope remains. The neutralizer, of course, is Seattle’s No. 1 defense, destined to put pressure on Rodgers behind a Richard Sherman-led secondary holding opposing passers to a Total QBR of 53.1 since Week 7 — third lowest in the NFL. The Seahawks aren’t looking to fall into a shootout with Green Bay’s offense. After watching DeMarco Murray slow down the game and pound the Packers for 123 yards on the ground last Sunday, offensive coordinator Darrell Bevell will lean on Marshawn Lynch. All the talk about Lynch leaving Seattle after the season seems ridiculous when you consider how this offense has channeled through its workhorse back since parting ways with Percy Harvin. With a league- and franchise-best 172.6 rushing yards per game in 2014, the ‘Hawks are pounding teams for 30 more yards per tilt than last season. Lynch led the way by accounting for 39 percent of Seattle’s offensive touches this season alongside an NFL-best 17 touchdowns. It’s not just Lynch, though, with Russell Wilson operating as a major factor outside the pocket. Seattle’s third-year passer has crossed the 100-yard barrier three times this year while averaging 53.1 rushing yards per outing since Week 10. Green Bay’s Julius Peppers was used all over the field against Dallas, but this 23rd-ranked run defense is in for another tough test on the ground. The Packers have struggled in three matchups against top-five rushers, allowing Lynch (110 yards in Week 1), LeSean McCoy (88 yards in Week 14) and Murray (123 yards on Sunday) to have their way. There have been six instances of the same teams meeting in Week 1 and then again in the conference championship. All six times, the team that won in Week 1 also won the conference title game. … Seattle’s defense allowed 159 receptions, 1,587 yards and five touchdowns to wide receivers in 2014 — all totals stood as the lowest in the NFL. … The Seahawks are 16-0 at home since 2012 when scoring 24-plus points. Green Bay’s defense has allowed 24-plus points just once in their last nine games. 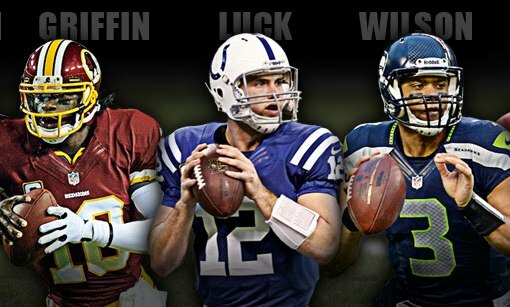 How good are these quarterbacks? Last week, Rodgers and Tony Romo faced off in a playoff matchup of the two highest-rated passers in NFL history (minimum 1,500 attempts). If the attempts minimum is lowered to 1,000, though, Rodgers and Russell Wilson are the two highest-rated signal-callers ever. … Lynch has been outstanding, but don’t forget about Eddie Lacy. His 72.9 yards per game are close to Beast Mode (80.3), while Lacy leads in yards per carry (4.7 to 4.6). We’ve come a long way since Week 1. Winning in Seattle remains close to impossible, but Green Bay’s offense has the firepower to test this secondary. It will be fascinating to watch wideouts Jordy Nelson and Randall Cobb square off against Sherman and fellow Seattle corner Byron Maxwell. Packers rookie pass-catcher Davante Adams — who shredded Dallas for 117 yards — looms as a juicy third target. The clear X-factor remains the health of Rodgers. If he can’t rely on his lower body, Seattle — allowing just 8.0 points per game in their last seven tilts — will clamp down. After the Seahawks overpowered Peyton Manning in February and Rodgers in September, I expect history to repeat itself on Sunday. ~The Green Bay Packers (13-4) return to a familiar venue Sunday when they visit the defending Super Bowl champion Seattle Seahawks (13-4) in the NFC championship game at CenturyLink Field. The site has served as the backdrop for two memorable matchups between the Packers and Seahawks. The first came Sept. 24, 2012, on “Monday Night Football,” the infamous Fail Mary game. Green Bay and Seattle also kicked off the 2014 regular season. The Packers lost both games. On most plays, it seems that Seattle has 13 or 14 guys on the field. They seem to have guys after the QB, running holes are plugged, and top receivers are double covered. They haven’t met the Seahawks in the playoffs since the 2008 divisional round, which they won. Green Bay’s only other postseason game against Seattle was the 2004 wild card, won in overtime on cornerback Al Harris’ interception returned for a touchdown. This will be the first time Green Bay plays a postseason game in Seattle, arguably the NFL’s toughest road environment. The Seahawks are 25-2 at home in the past three years, counting the playoffs. Sunday’s game matches MVP frontrunner Aaron Rodgers against the league’s top-ranked defense, with the winner advancing to Super Bowl XLIX. The following is a Seahawks scouting report based on interviews with players, coaches and scouts. Last week, Green Bay faced the NFL’s most productive running back in Dallas’ DeMarco Murray. Now, the challenge for its run defense increases. Seattle led the league with 172.6 rushing yards per game, 25.5 more than the No. 2 Cowboys. The Seahawks were the only NFL team to average more than 5 yards per carry this season (5.3), remarkable considering their 525 rushing attempts were second in the league. 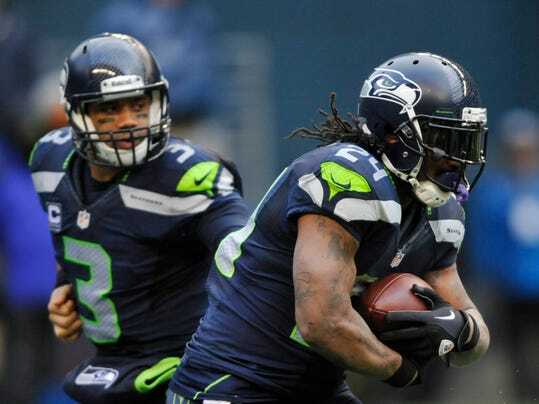 Running back Marshawn Lynch and quarterback Russell Wilson are the engine to Seattle’s offense. Lynch had one of his most productive seasons, tied for the league lead with 13 touchdowns and fourth with 1,306 rushing yards. Lynch had 757 rushing yards and nine touchdowns in the final eight games. Most impressively, he averaged 5.1 yards per carry in the season’s second half. Backup tailbacks Robert Turbin and Michael Christine are hard, physical runners, tough and quick, but they are not dynamic like Lynch. He was a second-team All-Pro this season behind Murray and Pittsburgh’s Le’Veon Bell, but he has a rare combination of power, balance and physicality. Lynch also plays his best games on the biggest stages. Seattle’s offensive line was plagued with injuries in 2014. Max Unger, an All-Pro center in 2012, missed all of his team’s season-ending six-game winning streak with a high-ankle sprain. Left guard James Carpenter also missed three games with an ankle sprain. Left tackle Russell Okung missed one game in December with a bruised lung. The right side of Seattle’s line stayed healthy. Right tackle Justin Britt and right guard J.R. Sweezy started all 17 games. They have been solid, their consistency providing much-needed lineup stability. But Lynch is the biggest reason the Seahawks led the NFL in rushing. He is one of the few backs who can make an average offensive line look good. Three seasons after leaving the University of Wisconsin, Wilson has proven to be one of the NFL’s smartest quarterbacks. He has the total package of intangibles — intelligence, composure, well-mannered. He shows a natural ability to lead, rare for a young player. Aside from Packers quarterback Aaron Rodgers, nobody is more dangerous extending plays and making something out of nothing when protection breaks down. Wilson is not a dynamic runner, but he knows when to run. His 849 rushing yards led all quarterbacks, and he’s especially dangerous moving the chains with his legs on third down. When Wilson scrambles, he’s almost always looking downfield, preferring to throw. His passing numbers won’t blow anyone away. He finished with 3,475 yards, 20 touchdowns and a 95 rating, outside the league leaders. Wilson’s most impressive passing stat is his seven interceptions. What makes Wilson dangerous is his mixture of speed, arm strength and ability to read a defense. The most important thing for Green Bay’s defense will be keeping him contained in the pocket. Doug Baldwin is sneaky fast, as the Saints found out the hard way. Doug Baldwin emerged as the Seahawks’ top receiver after losing Golden Tate to free agency in the offseason and Percy Harvin in a midseason trade. His numbers won’t wow anyone either — Baldwin led Seattle with 66 catches, 825 yards and had just three touchdowns — but he shouldn’t be overlooked. Baldwin makes big plays, as does second-year tight end Luke Willson (22 catches, 362 yards, three touchdowns). Willson ran a 4.5-second, 40-yard dash at the NFL combine two years ago and can stretch the field. Seattle’s offensive line isn’t the only group hit by injuries. The Seahawks lost rookie receiver Paul Richardson to a torn ACL in the divisional round against Carolina. Richardson was Wilson’s third option with just 29 catches for 271 yards and a touchdown, but the injury hurt because the youngster was coming along as a deep threat. Jermaine Kearse, the No. 2 option, had three catches for 129 yards and a touchdown against the Panthers. The key to Seattle’s passing attack is its ground game, both the frequency of carries and Wilson’s mobility. These are not dynamic receivers, but they get open by running crisp, sophisticated routes. The Seahawks take chances at opportune times. Their receivers make plays when you don’t expect them to. The numbers for the NFL’s top-ranked defense are dominant. The secondary — the famed Legion of Boom — gets the majority of praise as the best collection of defensive backs in football. Their rush defense isn’t far behind. Seattle ranked third in the NFL with 81.5 rushing yards allowed per game. It was one of two defenses to allow fewer than 3.5 yards per rush attempt, joining Detroit. It was tied for fifth with eight rushing touchdowns allowed, tied for fourth with 10 rushing fumbles. The Seahawks rely on team speed. Offenses won’t have success running laterally. They attack the ballcarrier like a pack of hyenas. Each player is fast. Each is athletic. Each is brash, confident. Each thinks alike. But a good offensive line can find success running downhill. Creases can be found between the tackles. For yards to be gained on the ground, those small openings need to be hit. The longest run Seattle allowed all season was 47 yards, which also ranks in the top 10. It’s difficult to break long runs against the Seahawks because there are no weaknesses on the second level. Seattle’s linebackers, anchored by Bobby Wagner, are among the best groups in the league. Wagner was an All-Pro — one of four on this defense — despite missing five games with a torn ligament in his right foot. He returned following Seattle’s loss at Kansas City in November, and the Seahawks won their next six games to close the season. Wagner’s speed, quickness and intelligence make him one of the NFL’s better middle linebackers. Outside linebackers Bruce Irvin and K.J. Wright also are fast, solid players. Here is where Seattle is special. Of the four starting members in the secondary, three are All-Pros. The fourth, cornerback Byron Maxwell, was the first to pick off Rodgers this season. The secondary’s accolades are well deserved, but Richard Sherman, Earl Thomas, Kam Chancellor and Maxwell can only play their style because the defensive line allows them. Seattle’s secondary trusts its defensive front will pressure the quarterback. Thus, corners and safeties press receivers, trying to jump routes. Seattle doesn’t always get to the quarterback — their 37 sacks rank 20th in the league — but the defensive line does enough to make the passer uncomfortable. Michael Bennett is the Seahawks’ best pass rusher, and he led the team with seven sacks. Irvin often rushes from linebacker, and he finished second on the team with 61/2 sacks. Sherman, the brash and outspoken two-time All-Pro, has played like the best cornerback in football this season. He has all the traits required for an elite cornerback, including instincts, smarts and good hands. In the Packers’ opener, Rodgers neglected to challenge Sherman with a single pass, effectively shutting down half the field. Maxwell is almost a carbon copy of Sherman, only not as talented. He replaced Brandon Browner when the original Legion of Boom member left for New England in free agency. Maxwell will be one of the top cornerbacks on the market when he becomes a free agent this offseason. Thomas is the best safety in football. Along with Chancellor, the duo also is the best pair of safeties in the league. Their similarities complement each other well — both are tough, smart and play with high energy — but there are also stark contrasts. Thomas has tremendous range, and he’s very active. Chancellor is the enforcer. He’s very physical and will knock receivers off their routes underneath. Jeremy Lane and rookie Tharold Simon see the field on nickel and dime packages. Simon is the secondary’s weak link. His movements are stiff, and he can be beat. The Seahawks aren’t dynamic on special teams, but they’re mostly solid. Seattle kicker Steven Hauschka ranked fifth in the league with 31 (of 37) field goals, an 83.8 percentage. He was 9-of-13 beyond 40 yards and 2-of-4 beyond 50. Punter Jon Ryan ranked 25th in the league with 44.1 yards per boot. Ryan did tie for ninth in the league with 28 punts inside the 20-yard line and only six touchbacks. He also tied for 10th with 22 fair catches forced. Seattle will take those numbers with its defense. The author failed to mention this aspect. Kam Chancellor can jump right over the blockers on field goals. The midseason departure of Harvin to the New York Jets was viewed as addition by subtraction. But there is no denying his absence has diminished Seattle’s big-play ability on special teams. The Seahawks rank 30th with 21 yards per kickoff return and 25th with 7.1 yards per punt return. On coverage, their 11.5 yards allowed per punt return is third-highest in the league, while their 24.1 yards allowed per kickoff return ranks middle of the pack. On Thursday, it was a night to remember for the “12th Man” crazies at CenturyLink Field and a night to forget for No. 12, Aaron Rodgers. Rodgers was outplayed once again in a big game, this time by Russell Wilson, as the Seahawks thrashed the Packers, 36-16, in the 94th season opener for Green Bay. Whereas Wilson was posting a passer rating of 110.9 and rushing for another 29 yards, Rodgers was ineffective, as evidenced by his rating of 81.5 and nothing on scrambles. Meanwhile, Marshawn Lynch basically owned the supposedly new-look Packers’ defense with 20 carries for 110 yards. The Seahawks rushed for 207 in all, having their way with a soft unit coordinated by Dom Capers that junked the 3-4 this summer for a base 4-3. It was just the 18th time in games started by Rodgers since 2008 that the Packers were underdogs. In those 18 games they’re 7-11, even though their largest spread was just 6 points. Green Bay was a 6-point underdog against the defending Super Bowl champions. In a 2010 game on the road against the New York Jets, the Packers won as the same 6-point underdog. It was a high-stakes game for quarterbacks, especially with the NFL’s most dominating defense across the line. It’s the way that the NFL game is set up in 2014. The play of the quarterbacks decides games. Only the poised Wilson responded. “Russell really, really played well,” Seattle coach Pete Carroll said. “He controlled the game all night long. The Packers now are 9-11-1 in their last 21 games. Green Bay’s receiving corps didn’t appear to help Rodgers. He did have time in the first half, especially before right tackle Bryan Bulaga went down with a knee injury, but time and again either had no clear target or failed to pull the trigger. His only interception was the responsibility of Jordy Nelson. It was the third straight season-opening defeat for coach Mike McCarthy, including two against the other NFC West heavyweight, San Francisco. McCarthy couldn’t have been happier about the team’s progress coming to Seattle, where the Seahawks are now 18-1 since 2012. The Packers trailed at halftime, 17-10, even though they had a 3-minute edge in time of possession. The problem was, they got off 32 plays making extensive use of the no-huddle, but their largest gain was merely 18 yards. “Our pass protection was pretty good,” Thompson said. “We were running the ball and doing some things, too. Seattle scored early on Steven Hauschka’s 35-yard field goal after the Packers forced the Seahawks to punt near midfield, but defensive end Mike Daniels ran into punter Jon Ryan, giving them a first down on fourth and 2. “That’s the price you pay sometimes when you’ve got these big guys doing that,” Thompson said, referring to 300-pound players on the punt-return team. 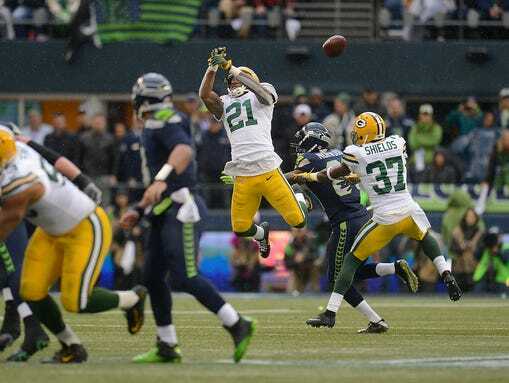 The Packers created a turnover when Earl Thomas fumbled on catching a punt and Ha Ha Clinton-Dix recovered at the Seattle 34. Seattle’s Richard Sherman blocked Davon House into Thomas. “He should have fair-caught that ball,” said Carroll. Even with two good legs, Rodgers was beaten & battered numerous times by the ferocious, pumped-up, amped-up, juiced-up Seattle defense. 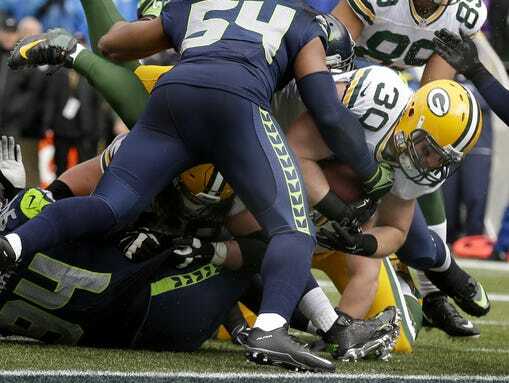 The Packers converted in six plays on John Kuhn’s 2-yard touchdown run behind Daniels, who substituted as an up back. Seattle struck back to regain the lead 3½ minutes later. The Packers were in great shape after tackle Justin Britt drew a holding penalty on the first play, but two runs for 17 yards by Lynch sandwiched around a 9-yard pass to Percy Harvin produced the first down. Harvin then ran a deep over route for 33 with Morgan Burnett trailing badly. On the next play, Wilson faked a run and, in front of him, Sam Shields came on a blitz. Wilson straightened up and found Ricardo Lockette wide open at the 21. Clinton-Dix dived at his legs at the 14, didn’t really slow him down, and it was a 33-yard touchdown. The Packers tied the score, 10-10, midway through the second quarter on a 12-play, 79-yard drive. Their longest gain, however, was 11 yards on a third-and-5 slant to Randall Cobb. By far Green Bay’s longest pickup was a 44-yard penalty for pass interference against middle linebacker Bobby Wagner, who couldn’t keep up with Cobb after Rodgers broke free and went deep. But two passes and a run gained merely 2 yards, leaving Mason Crosby to kick a 23-yard field goal for the unsatisfying finish. Tight end Zach Miller made a terrific extended catch against man coverage by Clay Matthews for 24 yards to start the Seahawks’ next possession. Then Lynch cut underneath Matthews on the left side for 21 before finishing off the six-play, 70-yard touchdown drive with a 9-yard run. He cut back to the left after starting right. Although the Packers were in their traditional 3-4 defense on the Seahawks’ first play from scrimmage, they used a 4-3 most of the time as their base look. Nose tackle Letroy Guion departed from the 3-4, and Mike Neal came in to join Julius Peppers at defensive end, with Matthews playing outside linebacker. “We’re trying to fit the personnel to where it needs to be,” said Thompson. As the first half drew to a close, the Packers tried six plays in a two-minute situation, but the long gain was an 18-yard pass to Cobb and they had to punt. Bulaga departed with a left knee injury with about 10 minutes left in the second quarter. He was replaced by Derek Sherrod, who finished the half without incident. The Packers’ fortunes sagged on the first play of the second half. Nelson dropped a slant pass that bounced to cornerback Byron Maxwell, who returned the interception 21 yards to the Green Bay 8. When the defense held, Hauschka made it 20-10 with a 20-yard field goal. 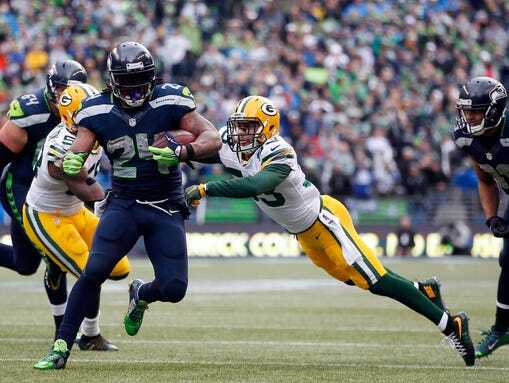 At last showing signs of life offensively, Green Bay advanced from its 20 to the Seattle 41. Then defensive end Cliff Avril beat Sherrod off the edge on fourth and 5 for a sack. “Cliff’s sack on fourth down kind of put us in command of the game,” Carroll said. After a punt by Seattle, Sherrod tried to short-set Michael Bennett on the first play. Sherrod missed, and Bennett was all over Rodgers to force a fumble that Sherrod recovered in the end zone for a safety. Green Bay’s defense, which at least had been semi-competitive, fell apart in the fourth quarter, yielding touchdown drives of 53 and 80 yards. Jan. 12, 2015 – After Green Bay lost to Seattle in Week 1, coach McCarthy took heat for his plan for the matchup. A lot has changed since then as the teams head for the NFC title game. 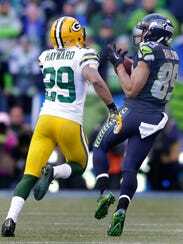 Jan. 12, 2015 – It was a matter of holding serve against the Dallas Cowboys Sunday afternoon for the Green Bay Packers in the NFC divisional playoffs after the Seattle Seahawks dispatched the Carolina Panthers on Saturday night. Jan. 12, 2015 – All teams change over a 4½-month span, but the changes to the Packers’ personnel on defense have been substantial. Jan. 12, 2015 – The clock has restarted on Green Bay Packers quarterback Aaron Rodgers’ recovery following the team’s 26-21 divisional playoff victory Sunday over Dallas. Updated Jan. 11, 2015 – Aaron Rodgers and his wonderful, injury-free supporting cast on offense were not going to be stopped by the Dallas Cowboys’ game but overmatched defense Sunday before a record crowd of 79,704 at Lambeau Field. ~Seahawks coach Pete Carroll said early this week that running back Marshawn Lynch was ready to “let it rip” after a preseason that saw him get just three carries after ending his early holdout from training camp. Carroll’s assessment was right on the money. Lynch ran 20 times for 110 yards and two touchdowns in Thursday night’s 36-16 win over the Packers and looked to be the same old Beast Mode that Seattle has come to love over the last few years. Most of Lynch’s work was done by hammering his way between the tackles, something that left Seahawks defensive end Michael Bennett with the impression that the Packers didn’t want anything to do with getting in front of the train. A sight seen too often. Marshawn Lynch slices through Capers’ Swiss Cheese defense for a Seattle touchdown. Brad Jones and Nick Perry were merely witnesses, although Jones didn’t even see it. On the bright side, Jones did not commit a penalty on the play. Whatever the reason for their inability to stop Lynch, the Packers have plenty of company in that department. Lynch has now run for at least 100 yards 20 times since the start of the 2011 season. That’s the most in the league over that span and there aren’t any signs he’s planning to stop now. ~The Seattle Seahawks opened the season on Sept. 4 by raising the Super Bowl XLVIII banner to the CenturyLink Field rafters and then hammering the Green Bay Packers. To get another banner, they’ll again have to beat the Packers, who will return to CenturyLink Field on Sunday with the NFC title and a berth in the Super Bowl on the line. Green Bay advanced with a 26-21 win over Dallas on Sunday in the NFC divisional playoffs. And afterward they pronounced that they are a different team than the one that was beaten 36-16 by the Seahawks four months ago. Rookie center Corey Linsley has anchored the Packers offensive line since his first start of any kind in Seattle back in week one. The Las Vegas oddsmakers, though, quickly installed Seattle as a 7½-point favorite, which was later determined by Pro Football Talk to be the biggest spread against Green Bay in Aaron Rodgers’ previous 113 career regular season or playoff starts. The home-field advantage — Seattle is 25-2 in the regular season and playoffs at CenturyLink Field since 2012 — contributes heavily to that line. It’s an advantage Seattle got in this game with a heavy assist from the Buffalo Bills, who beat the Packers 21-13 in week 15, a defeat that ultimately meant Green Bay and Seattle each finished with 12-4 records and gave the Seahawks the No. 1 seed in the NFC playoffs. Saturday, after beating Carolina 31-17 to advance to the NFC title game, Seattle players mostly said they didn’t care who they faced next. The few who did, such as defensive tackle Michael Bennett, said they hoped to play Dallas since the Cowboys handed the Seahawks their lone loss at home this season, 30-23 on Oct. 12. Bennett said he hoped Seattle could avenge that defeat. Instead, the Seahawks will hope against Green Bay to replicate what was one of their most dominating efforts of the season, holding a Packers’ offense that ended up leading the NFL in points scored with 486 to just one touchdown through the first three quarters (that coming after Earl Thomas fumbled a punt away at the Seattle 34) in building a big lead. Green Bay’s 255 yards were its second-lowest total of the season. In Rodgers’ two trips to Seattle since the Seahawks became the Legion of Doom, he’s been beaten and battered. And that was on two good wheels. Now Rodgers has a gimpy wheel and he’s no more than an old Dan Marino, Peyton Manning, Kyle Orton as a sitting duck. McCarthy is going to have to invent the greatest gameplan ever to get past this defense and into the Super Bowl. Rodgers was 23 of 33 for just 189 yards in a game in which he famously never once threw in the direction of Seattle cornerback Richard Sherman. The health of Rodgers will be a big story line this week as he is battling two injuries to his left calf suffered in the last two games of the regular season. Rodgers was noticeably hobbled throughout the win over Dallas on Sunday but still threw for 316 yards and three touchdowns and after the game told reporters that the injury won’t stop him from playing against the Seahawks. “I think I’ve got 120 minutes left in me so I’m going to do everything I can to play all of those minutes,” Rodgers told reporters in Green Bay. That, of course, is a reference to playing 60 minutes Sunday and 60 more in the Super Bowl on Feb. 1. Seattle, though, feels equally confident after advancing to the NFC title game for the second straight year. “We keep going out there doing our best and playing our hardest and we’re untouchable,’’ said cornerback Tharold Simon. It will be the third time the Seahawks and Packers have met in the playoffs but the first meeting in Seattle. The others came during the 2003 season on Jan. 4, 2004, a 33-27 Green Bay win in overtime in an NFC wild-card game, and during the 2007 season on Jan. 12, 2008, a 42-20 Packers win in a divisional game that proved to be the final postseason game for Mike Holmgren as Seattle’s coach. So what has changed since the Packers last played at Seattle? 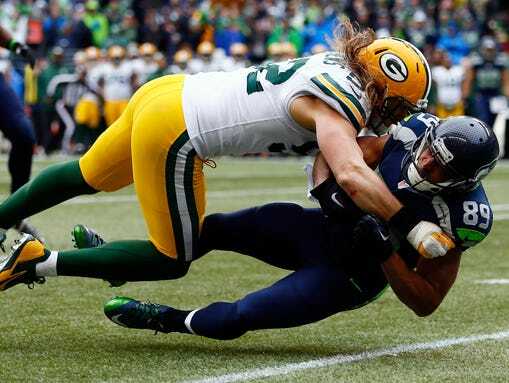 ~Green Bay — The Green Bay Packers and Seattle Seahawks meet again. This time, a ticket to the Super Bowl is at stake. Green Bay was beaten badly by Seattle in Week 1, 36-16, at Century Link Field. The Packers were outplayed on both sides of the ball, the offense played scared, Marshawn Lynch had himself a day, one injury proved costly. Start to finish, it was a night to forget for Green Bay. Now the two teams will meet in the NFC Championship. What has changed? Even on two good wheels, Rodgers has been beaten and battered by the Seattle defense in his two trips there over the past few seasons. Now on a blown wheel, McCarthy has to come up with a brilliant gameplan to somehow be able to do something offensively against them for the first time, with a wounded QB who’s legs used to be an asset. CB Tramon Williams: “We’re a different team, no doubt about it. That’s one of the first things I said when we went to Seattle earlier. We went in and we were confident in what we can do. But we didn’t play like we felt we should at that point in time. We knew that we should get better as a whole. Now we feel like we’re a different team than then. So it’s going to be a challenge, regardless. Tackling has been the Packers biggest weakness on defense, and nobody has exposed it more than Marshawn Lynch. It takes more than one guy to bring this guy down, and arm tackles won’t do it. Gotta go after his knees, which is what the NFL wants. DB Micah Hyde: “I think some personnel’s different. Some of our schemes are different. We just feel like we’re gelling together at this point of the season, rather than the first game. And with this “identity” change, Lang sees an offense that’s a lot more willing to run the ball, to stay balanced. On Sunday, Green Bay had 30 rushing attempts to 35 pass attempts. The presence of Eddie Lacy and the improved offensive line has changed the look of this Packers offense in January. Any outside “finesse” label the Packers may have in the past — through three straight postseasons — was shed “a long time ago,” Lang says. When the Packers want to run the ball, they’ve been able to. The play-calling flow has changed. In Week 17, they had a 100-yarder rusher against a defense that hadn’t allowed one all season. On Sunday, Lacy averaged 5.3 yards per carry and Aaron Rodgers had the necessary time to convert key third downs late.